Montgomery Ward Correctly Styled Dress Ad 1925 This is a 1925 advertisement It is a nice color ad from Montgomery Ward & Co. These dresses are lovely models in regular and extra sizes. Prices range from $9.85 to $16.98. Fabric is All wool border flannel, all wool crepe, all silk satin faced cantan crepe Please also note the matching hats on some of the models. In mint condition. Photo is taken through plastic and may show wrinkles or crookedness that is not in the ad. This magazine tear sheet measures 9 1/2"" wide by 13 1/2"" tall. 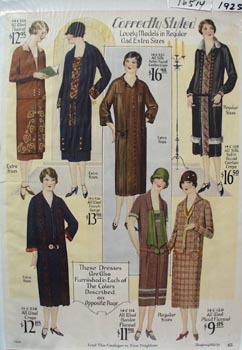 Items Similar To "Montgomery Ward Correctly Styled Dress Ad 1925"
Montgomery Ward Catalog 1927 Ad.